I’ve been meaning to get around to painting the trim in the living room for quite some time now. It was on my 30 Before Thirty list, but it was one of the handful of things I didn’t accomplish (because I was pregnant and had no energy). So I rolled it onto my Lovely life List, and I decided it’s finally a good time to check that one off. 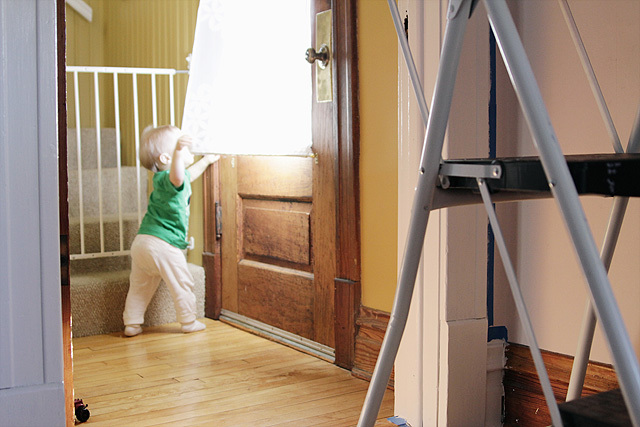 Painting projects (or any projects, really) happen so much more slowly now with two young kids underfoot. I let Eleanor help paint for the first time, and then she wanted to look through the fan decks to pick paint colors for the house. Did you know the exterior should be green? With sparkles? So it has been decreed. I’ve only painted half of the room so far. There’s a door between the living room and the entry, and soon I’ll move on to the front entry itself. I haven’t decided if I’ll be painting both doors there, and if so, which colors. I’ll probably leave the front door unpainted, at least for now. White is an obvious choice for the other, but I do like the look of black interior doors. What do you think? p.s. 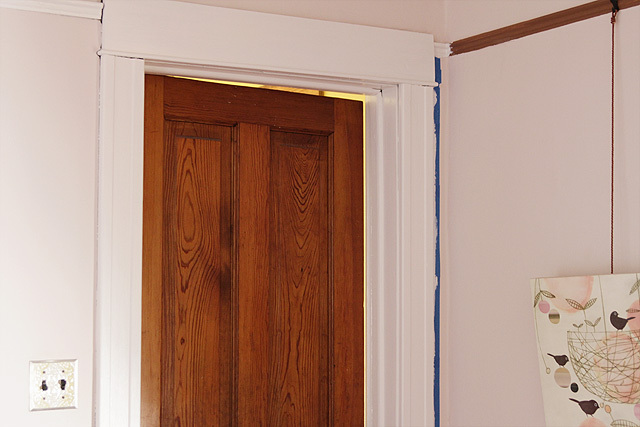 Here’s a refresher on why I’m painting all of this wood trim in the first place. Ooh, that’ll look so nice! I, too, live in an old home and we’ve painted the trim white as well. I mean, the house is almost 100 years old, that trim has seen better days, and now it’s lovely and fresh again with some white (our house, that is). Trust me, as an actual archaeologist, I do see the value in preservation and restoration, and leaving things like they were… but when you actually LIVE in the space with your family – well, you should love it! My house isn’t a museum and I don’t want it to look like one! 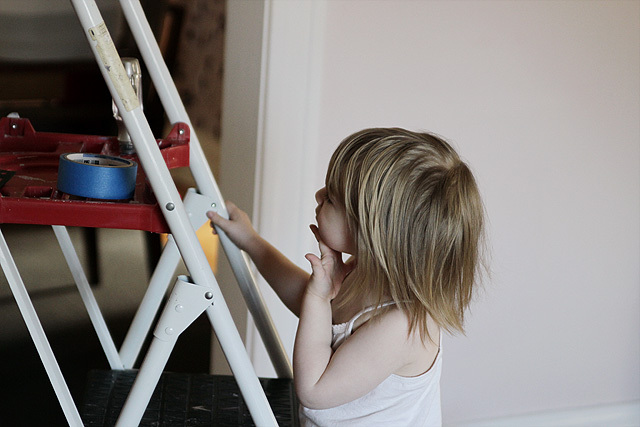 By the way, I am super impressed you will attempt painting by yourself with two small children – that I could not do! I love glossy, black interior doors. I say go for it! I love the white trim! I think I’d try leaving the doors wood for a few weeks before making any big decisions. A friend has it that way and I think it looks great. But I totally agree with your general philosophy that you should do what makes you, as the homeowner (and liver-in-er), happy. Just a note about white door – they get unbelievably dirty at child / dog level. Just something to bear in mind in the ‘which color’ debate. And, er, if you come to my house, please don’t crouch and look at the doors, mmkay? I love the white trim! It really helps visually organize the space. I love clean, fresh white for the interior doors but I love taking a bold chance with painting them black. Can’t wait to see what you choose. So lovely! I am delighted that you are painting the trim – it makes the whole room feel lighter and airier! I recently painted the doors in my interior black and LOVE them. I agree with Eleanor. Green with sparkles is the way to go :) The white trim looks great. I do like the look of the natural wood door though. Maybe wait and see how you like them with the white trim before deciding? i love the white trim! 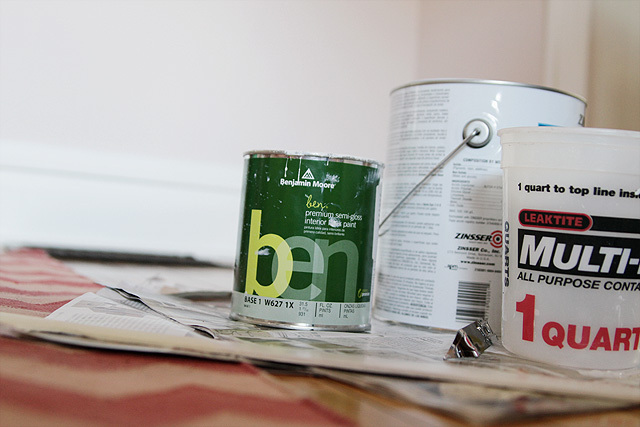 painting trim is so time-consuming, but it really is one of those low cost projects that give you a HUGE bang for your buck! Yes to the black doors! The trim is looking great. We have an old home too (100+) and I am strongly considering painting our wooden (and in not good shape at all) doors black. Be my guinea pig, please! I LOVE it!!! I say go for it. I used Benjamin Moore Soot as the color. 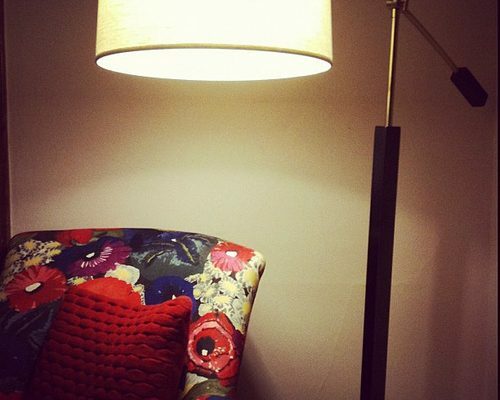 It’s the same color Anna over at D16 uses in various rooms and it’s a great color. I love your new blog design, but I’m afraid the font doesn’t look as it should for me. 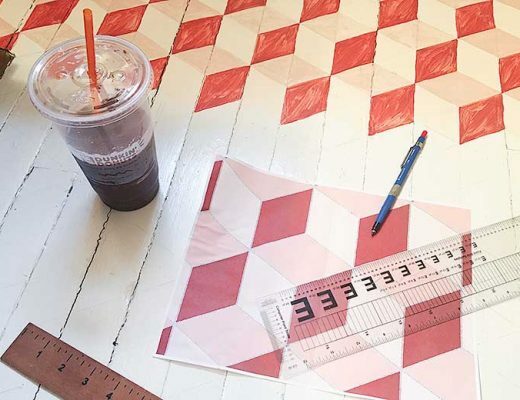 It seems some of the horizontal lines are too faint, so your title for this post ends up looking like, “PAINTING TIIE TRIM IN TIIE LIVING ROOM” for example. It’s confused me for a moment a couple of times. It’s a shame, too, because it’s such a beautiful font. Maybe others are not having this problem, is there something I can do on my computer to remedy it? I’m having the same trouble reading the new font. I’m using Firefox. Don’t know if that makes a difference or not. Taking a page from Eleanor’s book…how about a (kelly) green interior door? But no sparkles. I’m so excited to see the finished product! I think charcoal doors (much like the color of your honor roll posts would look so lovely. I think white trim looks so crisp and clean. I also love the look of a nice glossy black door though too – very classic. I think the white trim looks fantastic. You inspired me to think more seriously about painting ours from the original stain too. We had our windows done this past fall so I wanted to wait for that. We’ll see if I can get anything done this summer. Also, love black interior doors. You could definitely pull it off. Was thinking about where I could do that as well. Black interior doors, all the way! LOVE the old house trim. SO thick and gorgeous…looks great white. 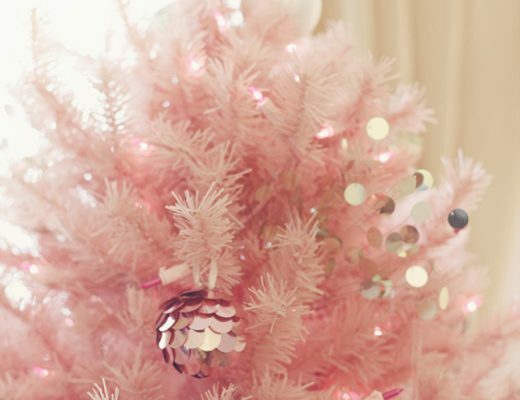 I think all houses should be sparkly. Smart girl. I hate dirty-looking ole varnished woodwork, love white trim. I’ve painted a lot of it. One word of advice- fill any little cracks/gaps with elastomeric (flexible) white caulk before you paint. It’s easy to do, is quickly paintable, and makes a huge difference. All those spaces read as black spots, and the caulk makes them go away, for a serene white result. White trim is THE way to go – it’ll brighten things up. We did ours in Benjamin Moore Cloud White. We live in a small 1930’s cottage-y style house so white was the way to go to make it seem larger and connected. And a nice backdrop for art! Laughed about the kids helping paint. My six year old daughter “helped” us paint a spare room when she was three. Takes a LITTLE bit longer, eh? I let out a big sigh when I saw the painted trim. It looks beautiful! I would so love to convince the hubs that the world will not stop turning if I paint our tired and worn wood trim. Besides, once it’s painted, people won’t know that it’s painted wood. They’ll just think it’s white trim. lovely job! Finally after five years of indecision and after reading your inspiring blog I have decided to paint the wood trim in our house. Wondering which primer you used. My primer does not seem to be covering the dark high gloss stain that the previous owners used. I did sand lightly and have used two coats of primer so far but I can still see the colour bleed through. Wondering if I should change primer at the point before painting. Your thoughts on this matter would be much appreciated. I used Kilz. You shouldn’t need more than one coat of primer, and you should definitely get that right before moving on to painting. Good luck! Which kilz product specificly? Is it Oil based? Latex? What’s the actual product name? I am so elated to have found this!! We have just started priming our upstairs hallway….I have had it with the dingy, dark wood in my old home!! (113 yrs!) I am loving it even tho its only primer…but already tired of the gasps and “I cant believe you are ruining your wood! !” I do have one question for you tho…did you run into any spots where the primer didn’t sink into the wood and it looks like cracks in the trim that weren’t seen before? 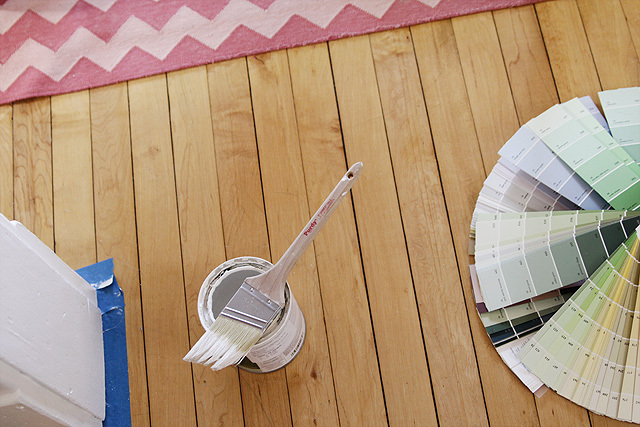 Do you add another coat of primer or use a certain type of paint??? I love the before and after photos you have…cant wait to get ours done!! !